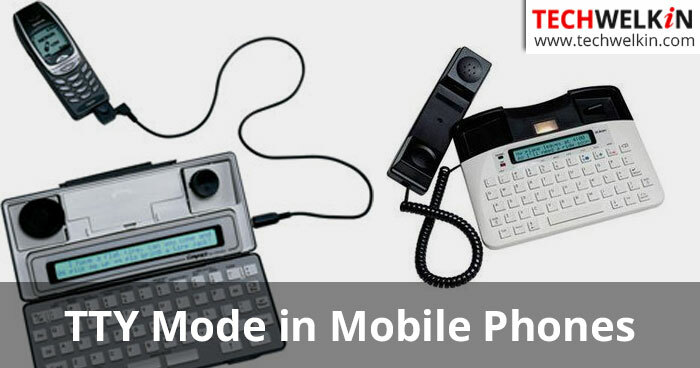 Learn what is the meaning of TTY mode in mobile phone settings. This options is available in all modern phones like iPhone and Android based devices. “What is the meaning of TTY mode in my mobile phone?”, one of the TechWelkin readers sent this query last week. And have selected this question to answer in today’s article. A teletypewriter (TTY) is a device used for communication by hearing-impaired and speech-impaired people. User types the message on a TTY machine and the machine transmits the message through a telephone line or mobile phone signal. The TTY machine on the recipient’s side will get the message and display it to the user on a text display screen. What is TTY mode in Mobile Phones? When a mobile phone user goes to her phone’s settings, they often find an option labelled as TTY mode off. People wonder what is this TTY mode and what’s the use of it. TTY mode is required to be enabled if you want to use a teletypewriter (also known as teleprinter) machine with your mobile phone. When TTY mode is on, the mobile phone will communicate with you through a TTY machine. NOTE: If TTY mode is on, some mobile phones may lose ability to take or make voice calls. Some other features of your mobile phone may also not work as expected. So, if you do not really intend to use TTY terminal, you should keep TTY mode off. TTY machines can be connected with both telephone landlines and mobile phones. When TTY mode is on and a TTY machine is connected with a mobile phone, the device simply uses mobile network to send and receive data. Users communicate more or less like using online chat applications. How to Enable TTY Mode? If you have a teletypewriter machine, connect it to the audio jack of your mobile phone and the go to Settings of your phone. Different mobile phones may show TTY mode in slightly different locations. But mostly you will find it in General settings (or Settings > Call settings). This option should be selected if both sender and receiver have TTY machines connected to their mobile phones. The two-way communication will take place through TTY. You should select this option if caller is hearing-impaired but can speak. In the Voice Carry Over (VCO) option, the caller sends her messages though voice and receives messages on a TTY text display. The Hearing Carry Over (HCO) option is used when the caller is is speech-impaired but can hear. The caller will send messages by typing them on a TTY machine and will receive messages by listening to them on phone. Can you communicate with a hearing-impaired person if you don’t have TTY? Yes, you can! If you do not have a TTY machine, you can make the call to a hearing-impaired person through Telecommunications Relay Service (TRS). In many countries, TRS is available as a toll free and round the clock service. To use TRS, you need to call the TRS number and ask the TRS operator to connect you to the hearing-impaired receiver. Then whatever you will speak, the TRS operator will type that on a TTY machine and the text will be transmitted to to the call receiver (who will see the text on her TTY text display). In the United States, 711 is the Telecommunications Relay Service number. Emergency TTY calls should be made directly to the regular 911 number. We hope now your questions regarding TTY mode in mobile phone are answered. Should you have any further questions, please feel free to post them here. The TechWelkin team and our reader community will try to answer your questions. Thank you for using TechWelkin! I am using Bluetooth device in my car for music through mobile, but this device is not supporting in call. Is there any setting in TTY so that the device can also support the calls. Steps for turning TTY mode off are given in the article. Please read the instructions.